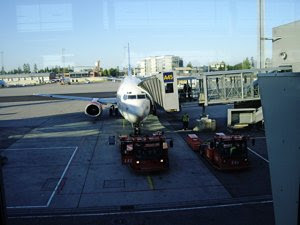 (Photo Kjetil Ree) On our way to Gran Canaria, we decided to have one night at SAS Radisson Oslo Airport Hotel, as we were to catch a very early flight. From here we had a short walk over to the termkinal building. That was not the only asset of the hotel. Staying at the Radisson SAS Oslo Airport Hotel was a great experience! The Radisson SAS Oslo Airport Hotel is located by the terminal building of Oslo Airport, perfect when you have an early flight to catch, as we had. The hotel is easily accessible directly from the airport, as well as the train terminal and bus stop. What the area has of practical assets, it lacks in beauty. This is an airport hotel, and the environment may therefore not be regarded as neither beautiful nor scenic. When arriving at the Radisson SAS Oslo Airport Hotel you are met by a very professional staff at the reception, as well as in bars and restaurant. This is certainly an area where the hotel chain has succeeded. 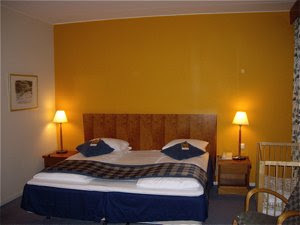 We had ordered an ordinary double room, and was pleasantly surprised of size and quality. The room was located by one of the sharp angled corners of the building. This meant that it was very spacious and light. The room was 20-25 square meters in size with all kinds of commodities. 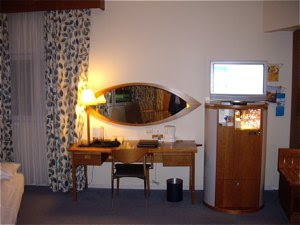 It had a retro look with at 1950 styled furniture, well colour coordinated in light shades and brightly coloured curtains. There were storage space in abundance, ironing board, trousers press, coffee machine, minibar, and flat screen television. The beds were very comfortable – I just wished we would have had the same beds at the Canary Islands. 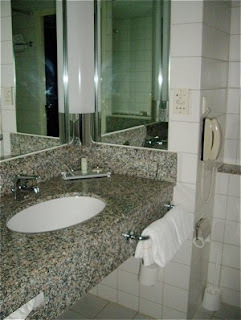 The bathroom lacked the same spaciousness as the room, but were practical with generous space for toiletries. It had a bath tub (hallelujah!) and hair drier. Both bathroom and room were very well maintained, not much to put your finger on – no cracked tiles, marks on walls or spots on the carpets. The hygiene followed the same high standard. I have enjoyed the SAS Radisson hotel breakfasts before and have always left very satisfies. At Toot's" restaurant serves all hotel guests "Super Breakfast" from early morning. As our flight sadly left as early as 6.45 AM, and we had to check in 5.45 at the latest, we left before breakfast time. I have no doubt that the breakfast at the Radisson SAS Oslo Airport Hotel would have been as delicious as the ones I have previously enjoyed at the other hotels in this chain. The Radisson SAS Oslo Airport Hotel is a professional business class hotel with a large number of facilities. You have wireless Internet access free of charge for all registered hotel guests. You get your password and username at the reception. There are several inhouse restaurants and a nice bar where you may enjoy your meals and a good drink during the evening. There is also a fully-equipped sports- and wellness centre offering a solarium, sauna and even a golf simulator with 32 virtual golf courses to choose from. The Radisson SAS Oslo Airport Hotel has a delicate designer hotel interior with many larger and smaller secluded areas where you may relax with your computer or with a book. At NOK 1190 for two, you are offered a superb hotel experience in a very pleasant distance from the airport terminal. It certainly is worth this price to rise in the morning and just walk over to the airport terminal to get your early plane. This is not the last time I have enjoyed at stay here.